"I have done plenty of courses through work in recent years, however, I would rank the Speechcamp course as the one that I took the most from back to the workplace. By taking the mystery out of public speaking and breaking it down scientifically, I am now much more aware of the effect I am having when presenting." “I would have no hesitation in recommending Speechcamp to both individuals and teams who wish to bring their presenting and communicating skills to the next level." "The public speaking course offered by Speechcamp to local businesses in South Dublin was rated very highly, with attendees recommending both the trainers and the training. We would have no hesitation in working with them again." "This course is different to many of those available. The insight revealed and coaching in Speechcamp is not limited to improving public speaking but will help you craft your sales pitch, develop stories that will inspire your team and build your confidence in your own ability to take on things that you normally would say ‘no' to. I would have no hesitation in recommending the Speechcamp experience." ​"Thank you so much for your support of our TEDx event. You both had a tremendous impact on the speakers' performances, and our audience felt that. I am super happy that we found you." "We have a very confident group of driver guides and they have just become more confident in what they do for living." 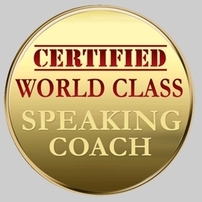 "Speechcamp are true professionals & masters in the technique of delivering a good speech. Their passion, enthusiasm & support helped me get beyond my fears & to a point where I actually find myself looking forward to my next presentation." Managing Director - Hampers & Co.